Personnel: Bassam Saba (flute, nay), Jamey Haddad (drums, cymbals), Roger Biwandu (drums), Stephen Sheehan (cymbals, djembe, percussion). 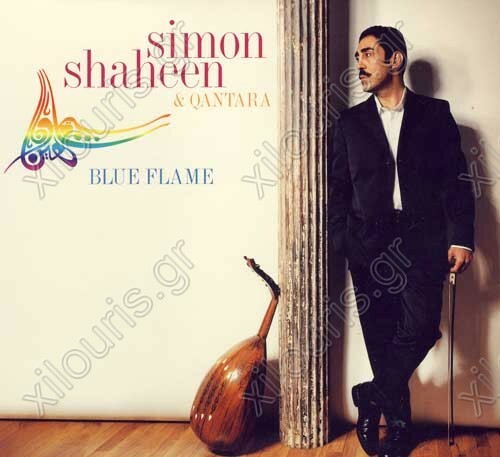 Simon Shaheen's Blue Flame is world fusion with a commercial twist. On this intriguing collection, Shaheen melds Arabic, jazz, Indian, North African Mediterranean, and classical music via his expertise on the oud and violin with compositions that often display congruity with Western pop song structure. "Waving Sands," with its stated melody in the intro and succeeding solo sections, recalls the exhilarating mesh of rock and jazz that such groundbreaking outfits as Weather Report and the Mahavishnu Orchestra championed in the early '70s. Shaheen's interpretation of Sting's "Tea in the Sahara" quickly develops into another captivating exercise of impromptu redefinition of Western music with layers of percussive polyrhythms and extended solos that flourish without obscuring the original motif. In the spirit of crossover appeal, Billy Idol guitarist Steve Stevens guests on "Silk Tears," a composition that evokes the sadness of a French chanson before exploding into grand moments of improvisation. It's definitely not something one would expect from the pairing of a world-renown Arabic instrumentalist with a guitarist who defined new wave rock in the 1980s; however, the combination of the two certainly captures the euphoric spirit of exploration which underpins each selection on this disc. Experimenting with a myriad of styles and subjects, Shaheen weaves Middle East and Turkish themes into "Olive Harvest," a joyful celebration of village life in his home of Tarshiha. In the track named for his dexterous backing ensemble "Al-Qantara," Shaheen employs heavy flamenco rhythms with complex passages that are lyrical and often play against the beat, implying altered time signatures and multiple key changes. Blue Flame is a cohesive and accessible array of world fusion that will appeal to purists and novices alike.